I really don’t know where to start with this species. It is wickedly attractive and beguiling – both its leaves and flowers – that part is easy to conclude. I long suspected it was some horticultural monstrosity that wasn’t validly published, but recently learned I was wrong. At least about the latter bit. There is much still to learn about evolutionary and possibly anthropological history of this species. The so very cool things that we learn from one another… here are two photos that Frances Crawford at Kew shared with me, taken of the elusive Ruellia currorii, which is known from less than 7 collections and is endemic to southern Angola and northern Namibia. The reality is that this name might turn out to ultimately be representative of two different species… one with purple flowers like the plants pictured, and one with white to cream flowers. Time and more collections will tell. For now, we can only gaze at the distinctiveness of this plant by its terete, almost Justicia-like stems. Wild Collected, Angola, Crawford #406 (K); Photos by Frances Crawford, used with permission. The maestro of the day, and quite possibly of the entire trip for the story you are about to read, was Tom Lemieux. Tom is the long-term Greenhouse Manager of the most remarkable “30th Street Greenhouses”, which are owned and operated by the Department of Ecology and Evolutionary Biology at the University of Colorado, Boulder. Tom has been in his position for over 2 decades and his craftsmanship as a plant propagator, procurer, and advocate makes him one of the most valuable members of our department. He came along on our research trip to lend a hand and also to learn a few new things about Acanthaceae / tropical botany. And on this particular day in early January 2015, were we so grateful for his participation and contributions. Ruellia cuatrecasasii (named in honor of the great Spanish botanist Jose Cuatrecasas) was, prior to our trip, one of those incredibly rare species that you generally know only from a museum. In fact, it was known only from the type collection, which was made by Cuatrecasas back in the 1960s. Given that the species was said to occur in mature forests of lowland Colombia, our a priori expectations were to find no suitable habitat left for this remarkable species. Nonetheless, we tried. The type locality took us near the tiny community (really just two houses) of Villa Arteaga, south of Chigorodó and north of Mutatá in NE Colombia. Much of the landscape was cutover but to our surprise there were scattered patches of intact, primary forests remaining within eyeshot of the highway. We eyed it like rabid dogs, and, very near to Arteaga, headed east on a short dirt road towards an oil palm refinery. Manuel and I went inside to inquire whether there was any chance that they might allow us access to the primary forest on their property, to search for this rare species. These sorts of conversations usually take at least 3 hours, and in the end, we thought for sure that they would say no. Our conversation with the foreman in a big, heavy construction site lasted about 9.5 seconds. He told us to go for it, and sent us on our way. Stepping into that forest felt so incredibly special not only because we were likely some of the first botanists to lay eyes on it, but also probably the last. It was a small patch no doubt, but one full of magic and life. In another 10 or 20 years, it will likely be as desolate as the rest of the cultivated landscape that surrounds it is. But not to ruin a great moment: we weren’t underneath that dark canopy 3 minutes before Tom looked at us, pointed towards a small tree, and said: “What’s that?”. It’s as if he knew what he was looking for, yet it was only I who had a good sense of what a sterile Acanth tree might be masquerading as…. We spent another 2 hours in lowland bliss and only saw a handful of other individual plants of Ruellia cuatrecasasii. Still, we found it in seed, which means that the species might forever be preserved in someone’s greenhouse, should we be lucky enough to grow it. To advance this goal, we immediately sent seeds to colleague Rosanna Freyre, who has one of the greenest thumbs of all…. An attractive species that is endemic to southern Mexico…and a stinky one. I can more or less determine its presence in a forest when I first walk into said forest, based on odor in the atmosphere (this also applies to the the other 10 or so taxa in the “bat-loving” Chiropterophila clade). I suspect this species represents an evolutionary “intermediate” in pollination systems (yeah Stebbins…just like you predicted…. ), i.e., that it is currently adapted to hummingbird pollination but is on its way to full blown bat pollination. Check out that nectary. Some serious fluids flowing from she. Is this plant uhmazin’ or WHAT? 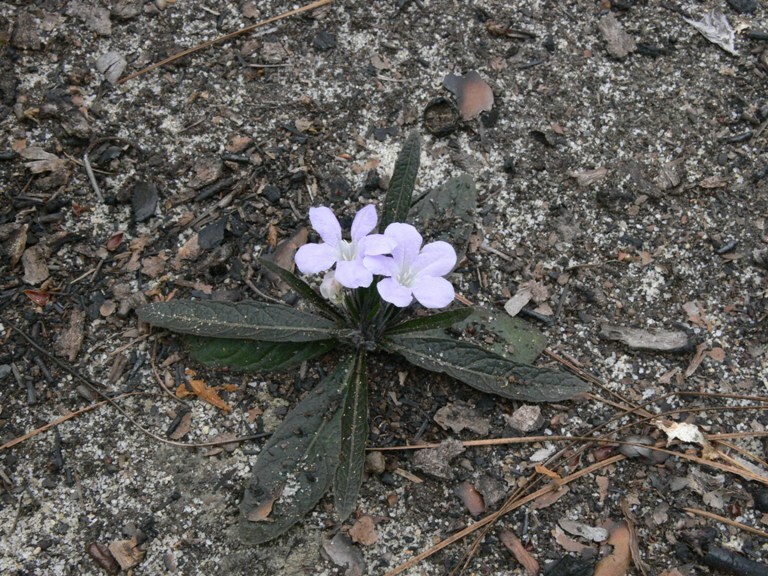 A basal-rosette forming southeastern US coastal plain endemic! It doesn’t get any better than that! …And one of two of our native (USA) species that I haven’t yet seen in the cellulose. HUGE thanks to Bruce Sorrie and the NC Natural Heritage Program for passing along this photo. 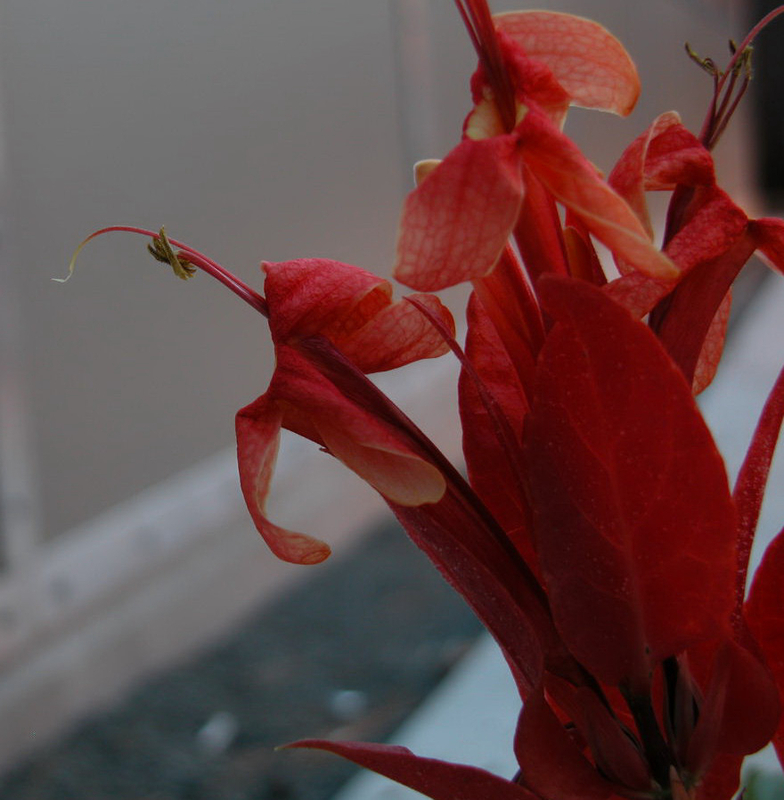 A very distinctive plant that deserves your undivided attention. This is one of those species that, in the past, some have struggled with in terms of identification. 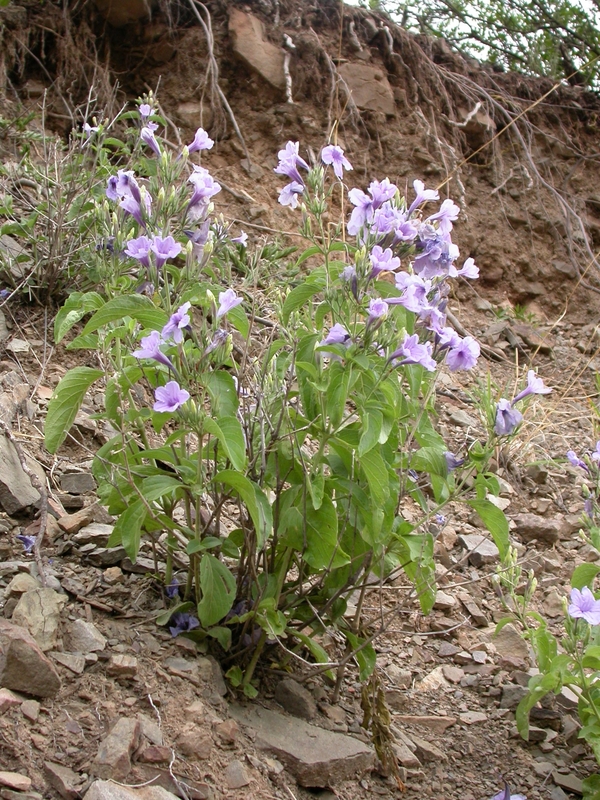 It is purple-flowered, long pedunculate, and produces elliptical/cylindrical capsules. Sounds a lot like Ruellia tuberosa and Ruellia simplex, right? You wouldn’t be crazy if you said so. Yet: they are different. Not by tremendous leaps and bounds, but… different. Ruellia ciliatiflora used to be known by its synonym, Ruellia lorentziana, in the southeastern USA, where it has become weedy in parts. If you grow this in your greenhouses, CAREFUL. It might take over! Its native range is entirely South American. A striking red-flowered species from western South America, Ruellia chartacea stands out in the genus for having arguably the showiest and most brightly colored bracts. 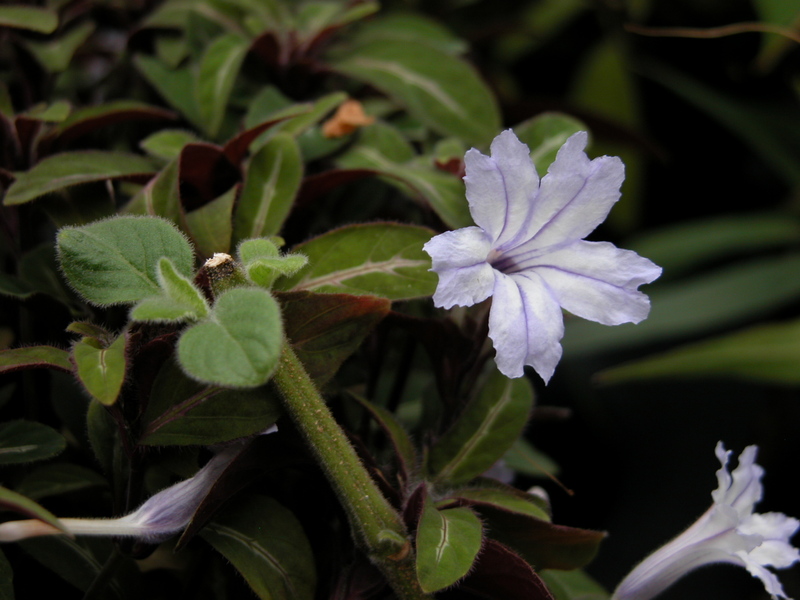 While this feature is widespread in other lineages of Acanthaceae (e.g., Justicia, Sanchezia), it is rather uncommon in Ruellia. Check out the loooooong red floral tubes. I sure would like to see this thing get pollinated (the hummingbird must be equally impressive). Based on inflorescence structure, Ruellia chartacea is a sure candidate for membership in the R. tubiflora / R. humboldtiana lineage. Clades are cool, especially when they make sense morphologically!